Click on the high-lighted links for further information, sound, videos etc. Eddie Peabody, the "King of the banjo", was a superb banjoist and showman who defined how plectrum banjo could be played "chord melody" style. He reached national fame in America during the mid 1920's by recording for many companies and offered them an economic way of producing a record by playing melody, initially alone or with a singer, then later with piano accompaniment and doing the singing himself. Eddie was born on February 16th, 1902 and started making music when he was a boy by playing the mandolin. As a young man he began to develop his unique plectrum banjo technique as early as 1920, soon after he left the U.S. Navy submarine service. Although known as a solo artist, he initially toured in Vaudeville theaters with his banjo playing pal Jimmy Maisel during the mid 1920's also conducting and performing with his own band. His first wife Maude Kelly was also his booking manager at the time. Popular songs of the day were very good for the banjo repertoire, "Ain't She Sweet? ", "Blue Skies", "Bye Bye Blackbird", etc, are now all standards in the American song book. Eddie was among the very first artists to record with the new medium of film with sound, known then as "Talkies", and from 1927 he made several movie shorts, initially for Vitaphone, for general cinema distribution including "Banjomania", "Syncopating Sensation", "Banjoland", "Eddie Peabody's College Chums" (with Hal Kemp's Collegians Orchestra) "Strum Fun" and "Peabody's Banjo School". In 1934 he teamed with Lee Tracey for his first major part in a feature film called "The Lemon Drop Kid". The effect of this new form of entertainment was dramatic and Eddie's popularity spread rapidly across the U.S.A. His appearances on radio programmes over WJZ in New York and subsequently the NBC network took his performances to every home with a radio - coast to coast - and he performed nightly at the famous singer Rudy Vallee's nightclub, the "Villa Vallee" whilst in the city. He visited England from 1929 until 1931 and again from 1937 until 1939, making several recordings for the Columbia and Decca companies. During his trips to England he helped to promote the banjo by visiting BMG clubs (Banjo, Mandolin and Guitar clubs) which were very active in the years up to the Second World War. He consequently toured across Europe shortly before hostilities began and was engaged in some covert U.S. Navy intelligence gathering activities by special request of President Franklin D. Roosevelt. He married his second wife Ragna Kaupanger in 1940 and together they had two children, Eddie jr. and George. In 1941, when the U.S.A entered the war, Eddie became a morale / entertainments officer for the U.S. Navy and was stationed at the Great Lakes Military Academy as a musical director. He already held the rank of Lt. Commander and was instructed to enlist and train band musicians. He also took his musical act to play shows in conflict areas across the Pacific to bring the servicemen "a touch of home". After the war over Eddie went about restarting his concert career. Most of the Vaudeville halls had closed down and musical tastes had changed dramatically. However, in 1948, "I'm Looking Over A Four Leafed Clover", a tune from the 1920's, was resurrected by the Art Mooney Orchestra and it became a runaway hit, creating interest in both nostalgic music and the banjo. DOT records capitalised on this craze by signing Eddie and he made thirteen albums for them up until the early 1960's, even producing two albums of how to play the banjo. In 1968 Dwight D. Eisenhower awarded him a distinguished People to People Award for his meritorious service in both the military and show business. In partnership with the Vega Banjo Company of Boston, he developed a new type of plectrum banjo, called the VegaVox. It featured a deeper resonator that rose the full height of the banjo's body (traditional resonators are about half as high as the body) thus increasing the banjo's interior resonation space, thereby giving it a distinctively mellow tone. 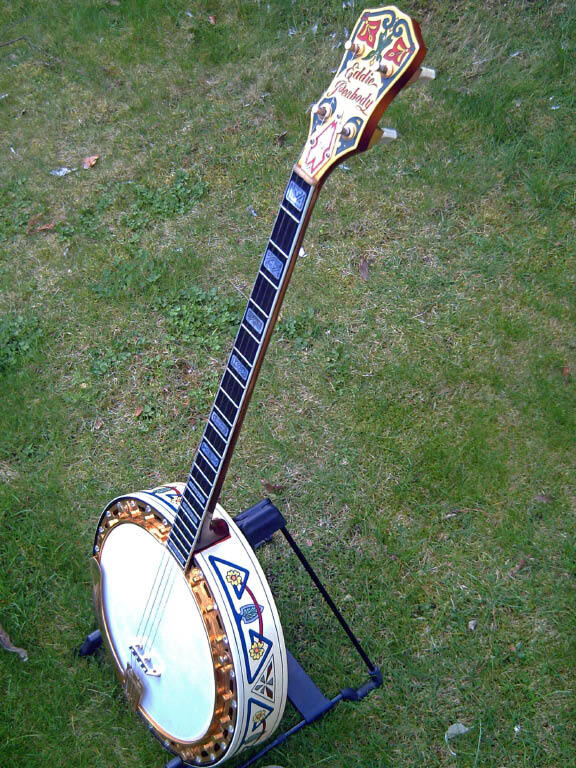 The Vegavox also featured a "top-tension" design that allowed the banjo head to be adjusted without removing the resonator. In the days before Mylar heads this was a great developement. 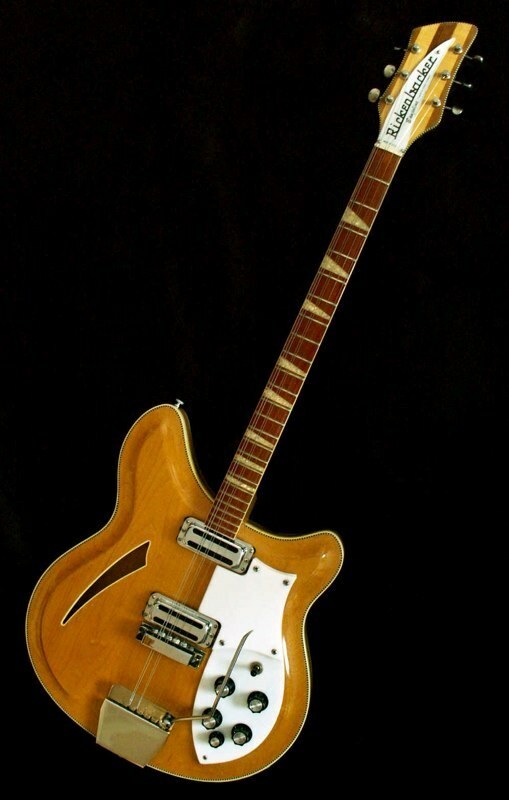 The VegaVox was produced primarily in four-stringed plectrum (22-fret) and tenor (19-fret) versions, however, some five-string models were made as special orders. Eddie played VegaVox banjos almost all of his career. Eddie also developed a special electric banjo which he called the Banjoline. The first prototypes were made by Vega, then Fender and finally they went into production with the Rickenbacker guitar company. It was tuned as a plectrum banjo but with doubled 3rd (tuned monotone) and 4th string (in octaves). He recorded two LP albums exclusively using the Banjoline for DOT records ("Smoothies" and "More Smoothies") and often featured it in this stage act. The Banjoline is now a highly prized collector's item although they are seldom seen on stage. Unlike many of his Vaudeville counter-parts from the 1920's, Eddie kept his musical act contemporary and was employed for the rest of his life by entertaining in the many supper clubs that were popular in the U.S. at the time and he also appeared on TV programmes such as The Lawerence Welk Show. Eddie actively promoted the banjo and remained in the entertainment business all of his life and it must be remembered that in the days before Earl Scruggs and Bluegrass music, the banjo was synonymous with Eddie Peabody. Among one of his last musical highlights was starring in a successful touring show called "America Sings", which was sponsored by the Hamms Brewery. It was designed to inject patriotism (of which Eddie was proud to be) into the community at a time when desention and unrest (the Vietnam war and race riots) were rife in America. His very last concert was on November 6th 1970, at a supper club in Covington, Kentucky called "The Lookout House", where he suffered a stroke during his act. He passed away, 68 years old, the next morning in hospital. He left behind a musical legacy that plectrum banjo players still cherish today. Further recommended reading:- "The Man with Banjo" by George Robert and "The Eddie Peabody Story", by Lowell H. Schreyer.